The yearly Doodle 4 Google India contest is back – It is once in a year opportunity for school going doodlers and artists to showcase their creative side to world! For those who are not aware of what Doodle 4 Google is, here is a quick description. Google has a long history of celebrating various occasions, events, achievements etc by integrating them creatively into their logo. 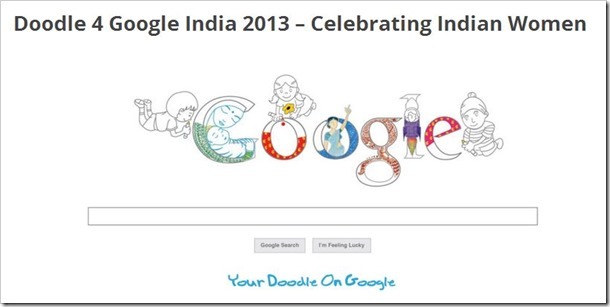 Once in a year, they arrange Doodle 4 Google contest in India open only for school students. The doodling has to be around a single theme that is announced every year by Google. The winner of this Doodle 4 Google contest are not only compensated by monetary prize, but also their artwork is shown on the Google India page for a whole day, which also means that it is seen by millions of people hitting their search engine. The winner is sure to be a celebrity, atleast for a day if not more. The theme for this year’s contest is “Celebrating Indian Women”. The participants will need to come up with creative doodles that integrate this theme around Google’s logo. The winners in each category will be invited to attend the final awards ceremony in November 2013. The finalists will be awarded with a certificate and a Google goodie bag. However, the biggest prize for national winner will be seeing their Doodle on the Google homepage for the whole day!